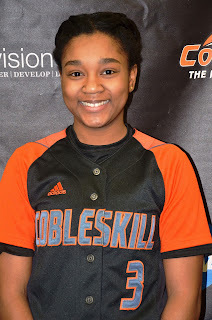 The SUNY Cobleskill Department of Sport & Exercise announced today that freshman Quesha Sell, Cobleskill, N.Y., Cobleskill-Richmondville High School, a member of the women’s softball team has been named the athletic program’s Fighting Tiger Athlete-of-the-Week. The Cobleskill, N.Y. native was the Fighting Tigers women’s softball team’s top performer at the 2017 Virginia Wesleyan Beach Blast hosted by Virginia Wesleyan College over the weekend at the Princess Anne Athletic Complex in Virginia Beach, Va. The freshman outfielder batted .429 for the weekend going 6-for-14 at the plate including a double, a triple, a stolen base and two RBIs in four games at the tournament. The Fighting Tigers, who open the season with a 1-3 overall record, will next be in action when they host North Eastern Athletic Conference (NEAC) rival SUNY Polytechnic Institute on Wednesday March 29th for a league doubleheader at Fighting Tiger Park beginning at 3:00 p.m.